We got the following edited quote on Quora saying "I record lots of important information on my iPhone notes app, and I would like to copy them from my device to my computer for storage. Is there any way to transfer iPhone notes to a computer without iTunes?" We will provide the answers to above question with the following discussion on how to back up iPhone notes without iTunes. Three ways on backing up iPhone notes without iTunes will be explained and you can read on the article to find useful info. iPhone, like all iOS devices, depends on iCloud to back up data on it. 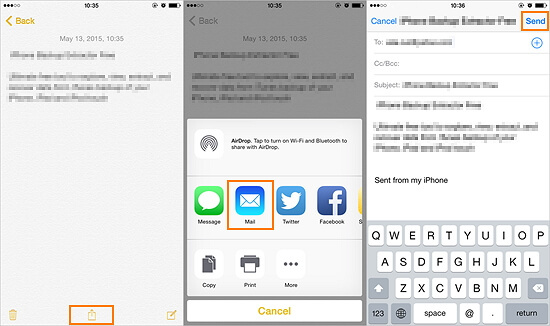 The following steps will back up your iPhone notes to iCloud. 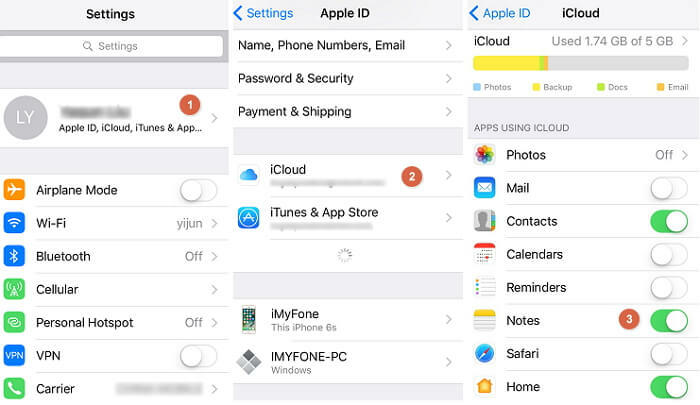 Open Settings and choose iCloud on your iPhone, sign in to iCloud accont using your Apple ID and passcode. Enable the toggle button of "Notes" to activate iCloud to automatically back up your notes. On your PC/Mac, install iCloud and sign in using your same iCloud account. Then you can check your iPhone notes on the computer. Start the Notes app on your iPhone. Choose note and tap the share icon and choose *Mail*. Go to your email account on your computer to access and download the notes you just sent to your email. 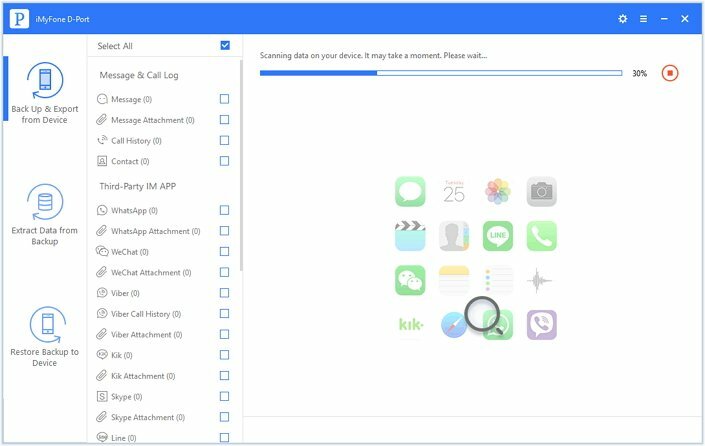 iOS data management used to be a challenging task before the advent of tools to help with various functions of iPhone and its sibling products. One such tool that has simplified the way iOS users deal with their data is iMyFone D-Port. We shall be discussing under this method. iMyFone D-Port brings flexibility to export your data from your iOS devices. It helps to you to simplify the way to handle iOS data. 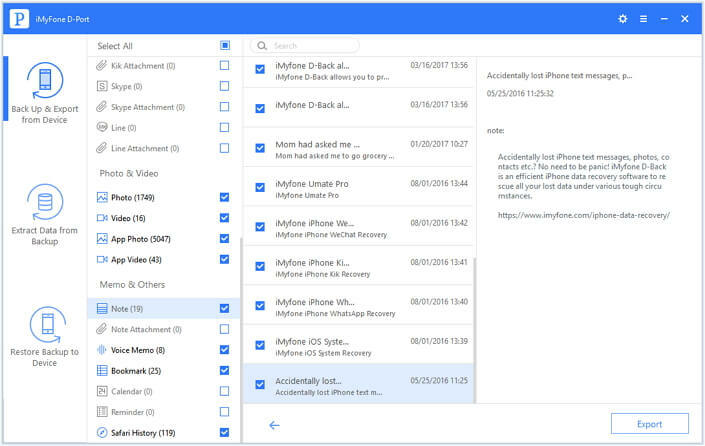 You can also back up your notes and attachments in notes from iPhone to computer with iMyFone D-Port so that you can view and use them anytime you want on computer. With the following features, iMyFone D-Port iPhone Data Exporter can do more than backing up your iPhone notes. Back up your iPhone entirely or selectively. Besides notes, you can also transfer voice memos from iPhone to computer, back up Viber messages on iPhone, and more. Export data from not only iOS devices, but also iTunes backups and iCloud backups, such as viewing photos in iTunes. Back up iPhone X and iPhone 8 also, let alone the older iPhones. Free trial offers the opportunity to try its excellent features before buying. Step 1. Download, install iMyFone D-Port on your PC/Mac and open it. Locate the "Back Up & Export from iOS Device" tab and click on "Export Data" to select the type of file to export. You can check "Note" or all the data types. Step 2. Click "Next" to get the iMyFone data exporter connect your iPhone. Click "Scan" and then the program will scan your iPhone for a while depending on the storage size of the phone. Step 3. Once the scan is through, a list of scanned items will be displayed. Preview the list and navigate the different tabs to select the files to export. Then click the "Export" button to export the notes. You will see a pop-up window prompting you to select the destination of your data on the computer. Do as asked and see your data exported from your iPhone to your computer. And you are done toback up iPhone notes without iTunes easily. The three methods to back up notes from your iOS device to computer are excellent to secure your iPhone notes. These methods are easy and safe to accomplish. But when you take a closer look at the features of each method discussed, you will discover that the iMyFone D-Port iPhone Data Exporter offers a far-reaching solution you can depend on anytime. It provides more functions and even gives you a free trial solution to try it before investing your money. 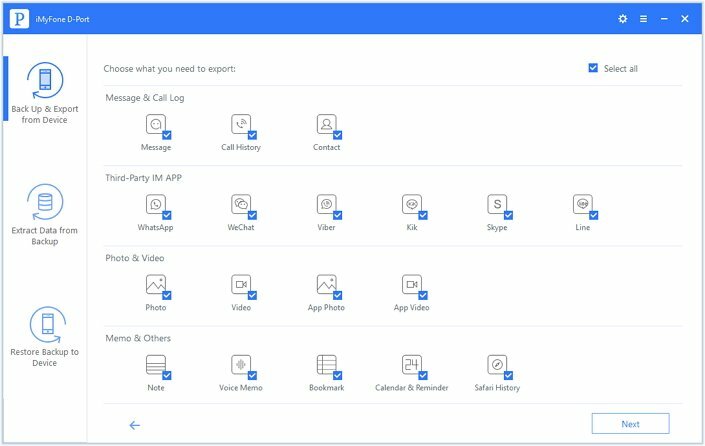 Download and try the iMyFone D-Port app on your computer now!